Balcarrick Golf Club is located in Donabate, North County Dublin - just 15 minutes from Dublin Airport and 12 miles from Dublin City Centre - and is an estuary style golf course, mixing the best of parkland and links golf course styles. 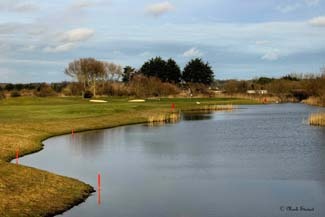 Balcarrick provides year round tees and greens and believe that the greens are amongst the best you'll find in Ireland. Water is a feature on nearly all holes and the Par 3's are particularly challenging. The great value green fee package is designed to balance risk & reward and so provide a fair result for the shots you decide to play!! This 18 hole Par 73 golf course of over 6800 yards, is GPS enabled and is a popular venue for visitors from home and abroad. The golf club was founded in 1972 under the name of Dublin & County Golf Club, changing its name to Balcarrick Golf Club in 1992. The golf course was initially designed by Barry Langan and its re-development by Roger Jones in 2007 has received international acclaim.